Bellingham Automotive is continuing to celebrate our 25 years in business with 25 Acts of Kindness! 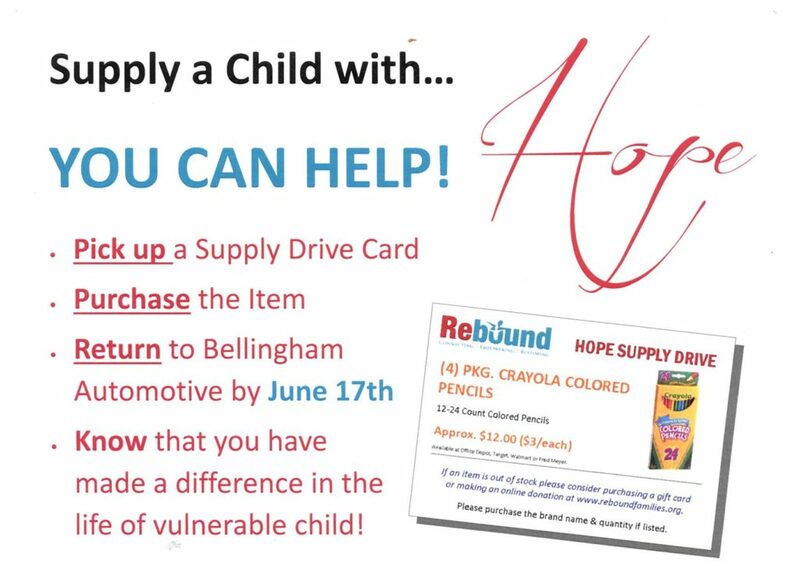 This month Bellingham Automotive is helping to provide “HOPE” for vulnerable children in our community by providing them with supplies they need for Rebound’s Ray of Hope summer camp. Ray of Hope is a 6-week summer day camp program for children ages 5-12 years old dealing with emotional, behavioral and/or economic challenges. Kids are taught life skills necessary to understand, talk about and cope with what is happening in their lives in health, positive ways. Bellingham Automotive has Supply Drive cards available at our shop. Supply cards are items needed for this summer’s camp. Items range from colored pencils to juice boxes and many things in between. You may pick up a card, purchase the item on the card, and return the item to Bellingham Automotive by June 17th. A supply drive is an easy way for people to tangibly support vulnerable local children. Operating a 6-week summer program for 100 children is very costly. By inviting the community into our need we hope to reduce some, if not all, of the operating costs for field trips, supplies and snacks in order to ensure that every child is given the oppurtunity to just be a kid and develop crucial social skill.